In 1892, Madame PELLEGRIN, widow of the owner of the Café du Jardin at Granvelle, nicknamed the “Casino du Jardin”, wanted to construct 2 buildings: one to house a circus (today, the Grand Kursaal) and the other a café/restaurant (brasserie) with a casino (today called La Salle Proudhon) on the land occupied by the café. The word ‘KURSAAL’ is German for a public building in cities that had spas, where entertainment was provided. And Besançon had a spa in the 19th and early 20th centuries. 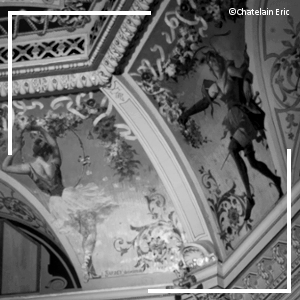 It was an ambitious project whose aim was to create a place of entertainment which would attract Besançon citizens, spa clients and members of the military posted there. The café was demolished, she bought the land which she had previously rented (2,200 square metres) and in January 1893, construction began. The plans dated 1895 show that two architects worked at the site: Louis Garin from Besançon and Claude Porte from Lyon. The façade was made of cut stone and brick decorated by four columns of pink stone, each with a capital of a sculpted lyre, a balcony, coloured geometric friezes under the windows, escutcheons and cartouches (meant as supports for the sculptures which were never made) and window panes glazed with floral motifs. This type of building was very popular in the late 19th century in Germany, eastern France, Switzerland and northern Italy. The architecture was thermal (iron was used in the supporting structure, and there was a pronounced taste for eclecticism and polychrome); it expressed a certain way of living and taste for things festive. Louis Bardey, a painter from Lyon, decorated the large hall (dated and signed in 1893) with comically distorted figures and motifs of Ancient Greece mixed in with circus performers and accessories. The Kursaal Circus was inaugurated in great pomp in late 1893, but the premises and roof were not entirely finished. One distinctive feature about the Kursaal was its removable flooring. For the circus shows, the flooring had to be disassembled to make room for a circus ring; stands were then installed around the ring. Unfortunately, two years later, Mme Pellegrin had to sell the Kursaal: she was deeply in debt due to the project. Neighbouring café owners heaved a sigh of relief: competition with the Kursaal brasserie had been fierce. The city of Besançon, which had no space specifically for circuses (they were very popular at the time) or for other types of large gatherings, bought the Kursaal on 14 March 1895 and turned it into a community hall. It also decided to close down the brasserie to eliminate competition to the other cafés. Work was begun in what is today the Salle Proudhon to house the city’s school of music and its fine arts school. 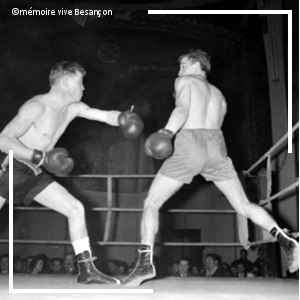 Over several decades (between WWI and WWII), balls, banquets, charity galas, sports events (gymnastics, boxing and wrestling matches: popular in the 30s), plays, films and political meetings were held in the Kursaal. In 1919, the name “Kursaal” was dropped and replaced by “Variety Hall”. It was commandeered by the army in 1940, and after the war it was renamed the Kursaal and continued to host events. As the years passed, the hall began to show its age: the removable flooring was deteriorating from the repeated assembling/disassembling and the two balconies, no longer able to safely take on any additional weight, were closed off. In 1965, the City Council, with a heavy heart, decided to close the Kursaal down because of its safety problems. The councillors had several questions on the table: Tear it down and build a new building in its place? Raze it and build a car park? Restore and modernise it? Opinion was divided and many discussions were held. 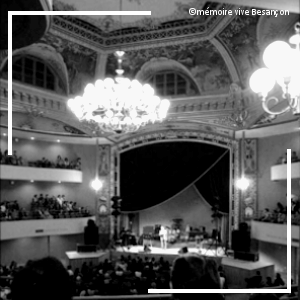 In 1979, Robert Schwint, mayor of Besançon, and his city council decided to completely renovate the building and to create a 350-seat conference hall in the basement which became the Petit Kursaal (in 1893, it was the stable for the circus animals). It had been closed to the public for 17 years (including the 3 years required for renovation) when, finally, in September 1982 the Kursaal was opened. Singular efforts had been made to preserve its originality and its charm of yesteryear. Today, the building comprises the Grand Kursaal, the Petit Kursaal, a bar, a kitchen and 8 adjoining rooms ranging from 50 to 200 square metres. A team of 16 people work there for its management and operation. The Grand Kursaal’s acoustics are much appreciated by orchestra conductors, musicians and choral societies. Every year, about 110,000 people attend its 700 events, 70% of which are organised by volunteer associations. These events include: blood donor days, dinner dances, gala evenings, conferences, lectures, seminars, conventions, meetings, exhibitions, second-hand clothing and book sales, variety shows, plays, and political meetings (it is where people meet for election results). The Petit Kursaal also serves as an arthouse cinema, showing about 200 films per year.